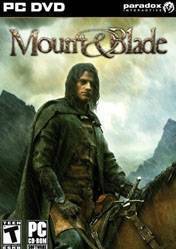 Mount&Blade is a medieval, single-player, open-ended, action role-playing video game for Windows, developed by the Turkish company TaleWorlds, and published by Paradox Interactive. Mount&Blade is a single-player, action-oriented role-playing game without any fantasy elements, which takes place in a medieval land named Calradia. The game features a sandbox gameplay style, in which there is no storyline present. The player is able to join one of the five battling factions, fight as a mercenary, assume the role of an outlaw, or take a neutral side. There are no comments yet about Mount and Blade . You can be the first one!